Everyone knows the famous Kool-Aid drink packets. Purplesaurus Rex, Cherry, Berry Blue, etc, etc. But drink packets aren’t the only thing Kool-Aid made. 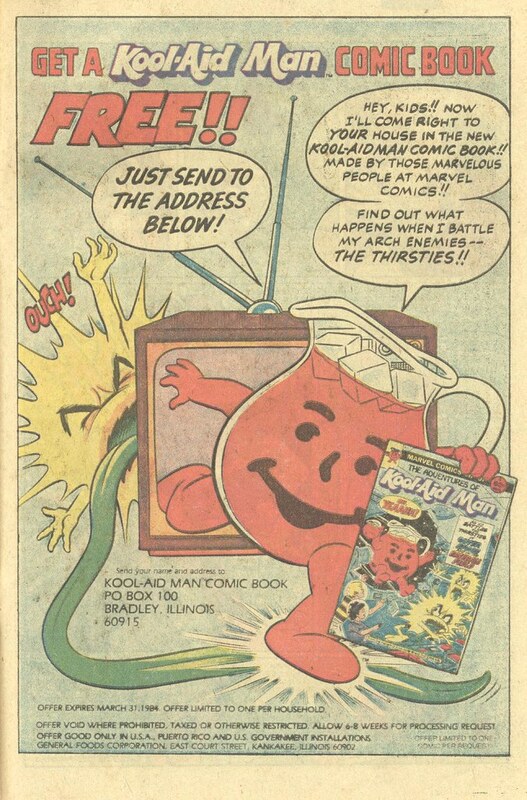 There is a plethora of items made under the Kool-Aid banner trying to capitalize on the popularity of one Mr Man (Kool-Aid Man). 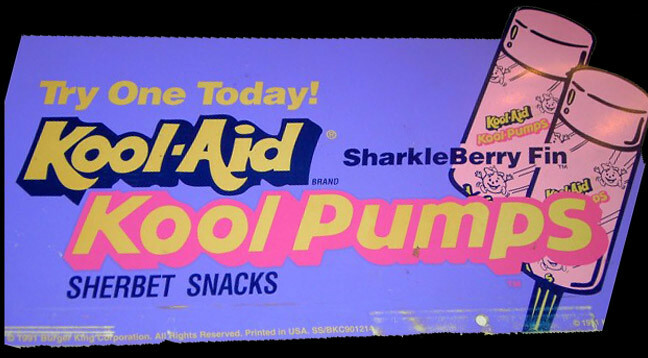 Here are 11 items made under the Kool-Aid brand that you may not have known existed. 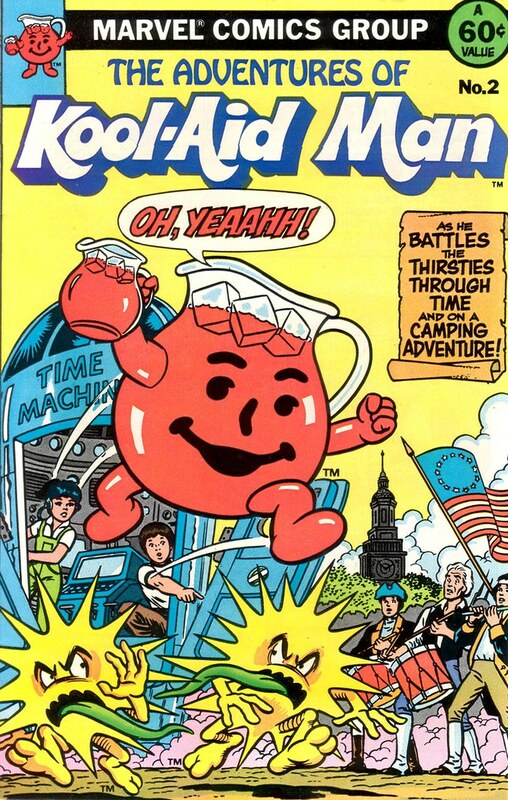 Kool-Aid Man comic books – Kool-Aid and Marvel Comics collaborated on issues #1, #2 and #3 of The Adventures of Kool-Aid Man comic book. Archie Comics then published issues #4 and #5. Several of these issues were given out free in a mail away premium, and several issues were also available in stores. You might think it would be difficult to come up with engaging stories involving a talking pitcher of Kool-Aid quenching the thirsts of little children, and you would be mostly right. However, the stories were zany and mostly entertaining, considering the entire comic is an advertisement for drink mix. 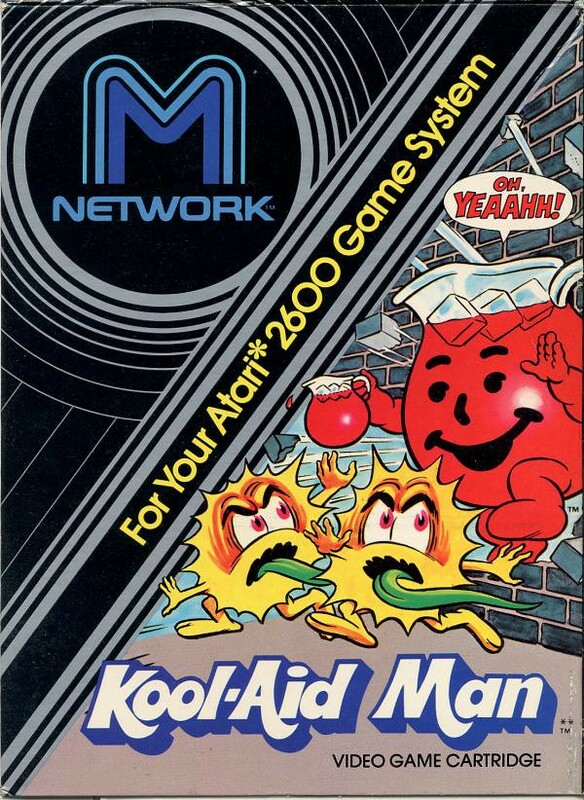 Kool-Aid Man video game – Yes, there was a video game based on Kool-Aid Man. It was released for the Atari 2600, Intellivision and Sears video game systems. The ad and box above are for the Intellivision version. Here is the box for the Atari 2600 version. If you really want to understand the meaning of the word tedious, then download a ROM of this game and play it. 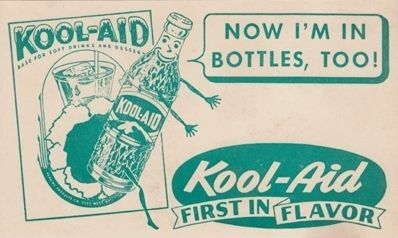 Kool-Aid bottled drinks – For a while back in the 50s and 60s, Kool-Aid offered their flavors pre-mixed in glass bottles. I’m not sure if they were carbonated or not, but I don’t believe so. Kool-Aid Kool Pumps – This was a fast food promotion with Burger King. The “push-up” style sherbert bars were flavored with the elusive Sharkleberry Fin. Matt talked about them on X-Entertainment a while back. 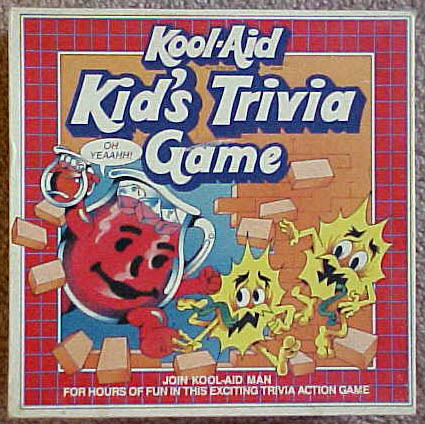 Kool-Aid Kid’s Trivia Game – From 1985. This actually existed. It played like Trivial Pursuit, but I would hope the questions dealt with more than just Kool-Aid. How many questions can there be about Kool-Aid? 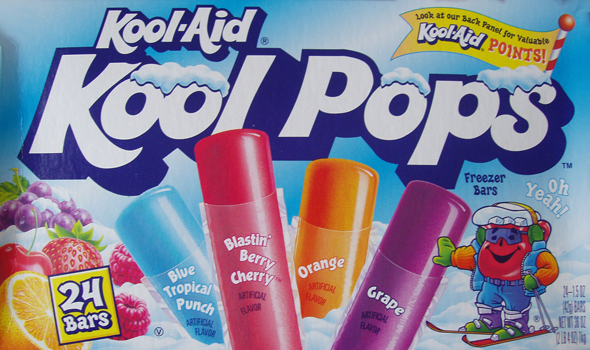 Kool-Aid Kool Pops – These are the regular Kool-Aid Popsicles. If I’m not mistaken, these are still on sale, but they are really hard to find. At least where I am. 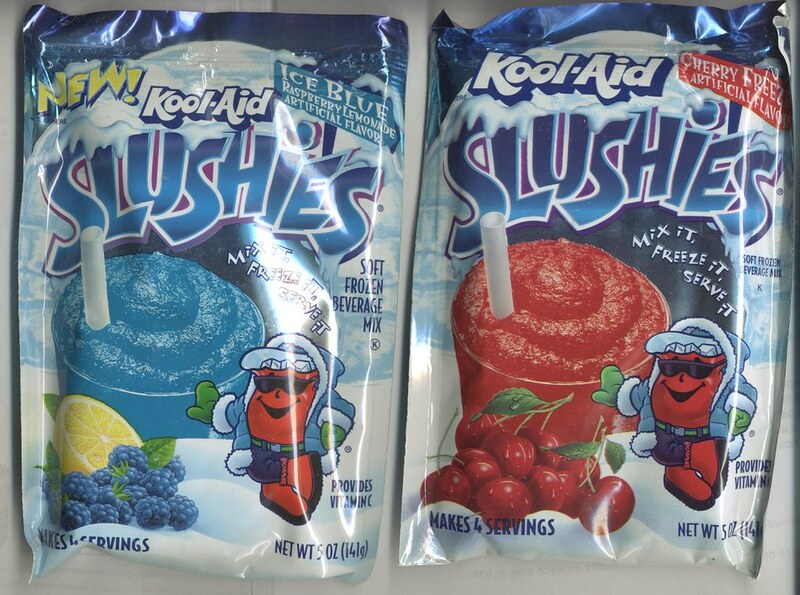 Kool-Aid Slushies – These were offered in the 90s and were pretty awesome. Slushy mixes that came in three flavors; Lemon Ice, Ice Blue and Cherry Freeze. Goes perfect with your favorite alcohol. 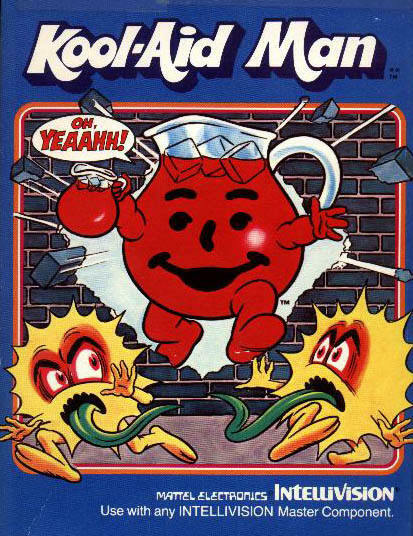 Let the Kool-Aid Man get you hammered tonight. Kool-Aid Ice Cream Mix – This is interesting. Kool-Aid Mix specifically for flavoring ice cream. You probably could just do this with regular Kool-Aid. 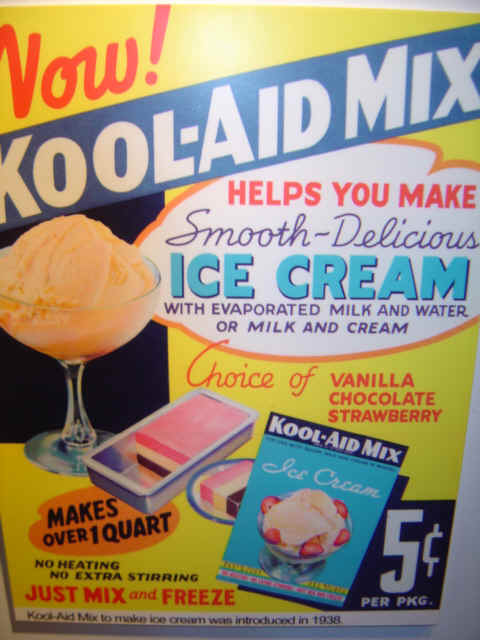 In fact, this is probably just regular Kool-Aid powder rebranded with the Ice Cream Mix logo. Very clever. Kool-Aid Fruit-Ts – Kool-Aid made flavored teas back in the 90s. An interesting concept that didn’t take off like they had hoped. Pictured are the three flavors offered; Wildberry, Strawberry and Lemonade. 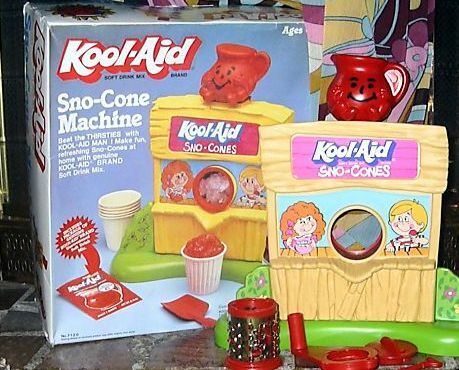 Kool-Aid Sno-Cone Machine – Everyone and everything gets a Sno-Cone machine at some point. I’m sure if you look hard enough you’ll see a Golden Girls Sno-Cone Machine. You can thank Snoopy for that. I think this may still be offered, but it’s now called the Kool-Aid Freeze Factory. 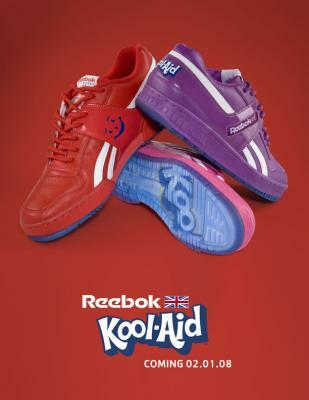 Kool-Aid shoes by Reebok – In 2008 Reebok released a line of shoes inspired by Kool-Aid flavors and Kool-Aid Man. You can still buy these shoes. Check out SneakerFiles.com for pics of all the different shoes offered. This entry was posted on November 23, 2010 at 1:00 am and is filed under Atari, comic books, ice cream, Kool Aid, pop culture, video games with tags Atari, comic books, Kool Aid, pop culture, video games. You can follow any responses to this entry through the RSS 2.0 feed. You can skip to the end and leave a response. Pinging is currently not allowed. Excellent overview about the mass of products offered by Kool-Aid. 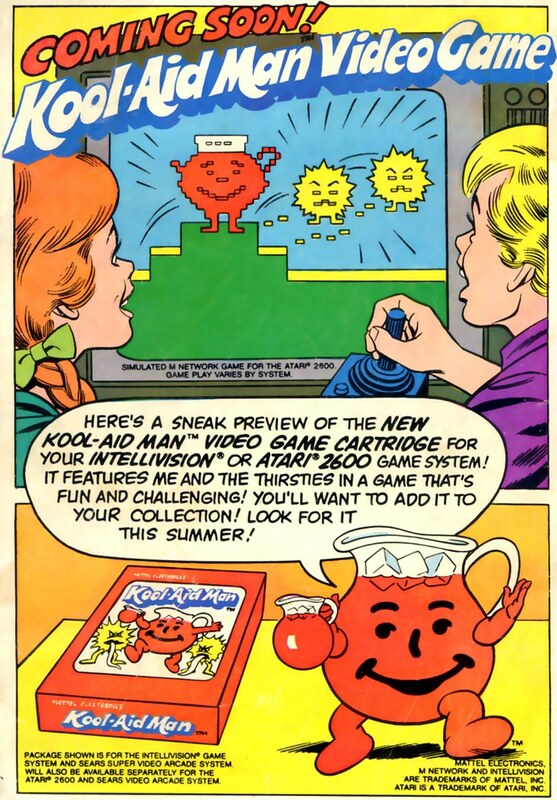 I’m fascinated by Kool-Aid Man as a character and always have been. Who is he? Where did he come from? How did he get like this? What happens if he trips and spills? Does his life come from being Kool-Aid or a sentient pitcher? So many questions and so few answers. Well, except for in the Kool-Aid Man fanfic that’s out there. I had an issue or two of the comic book, which I seem to recall enjoying quite a bit. I really enjoyed this, but still have a question on my mind. I’m 19 and seem to remember drinking a kool aid burst product that had small half in long tablets that fit just in the opening on the top of the kool aid burst when i was between the ages of 4 and 7. When you dropped them in they changed the color and possibly flavor of your drink. I CANT SEEM TO FIN TRAcE OF THEM ANYWHERE! please let me know this isn’t a figment of my imagination. I personally have no recollection of that. It sure sounds interesting. Sarah! I have been looking for those for years! I am 19 now and everyone I know calls me crazy. Have you had any luck? Hey There. I found your blog the usage of msn. This is a really well written article. I will make sure to bookmark it and come back to read extra of your useful info. Thanks for the post. I will definitely comeback. In approximately 1948 I remember a product that I thought was kool aid that was sold in a glass vial in powder form with a cork seal… is there anyone that can remember a product of this nature?? ?